Until he meets Libby. When the two get tangled up in a cruel high school game—which lands them in group counseling and community service—Libby and Jack are both pissed, and then surprised. Because the more time they spend together, the less alone they feel. Because sometimes when you meet someone, it changes the world, theirs and yours (goodreads). 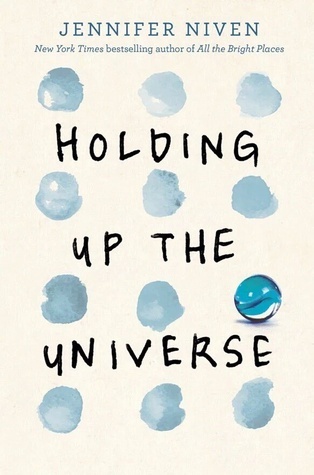 Holding Up the Universe is a story of redemption and an inspiration to keep moving forward. Plot: Libby and Jack are two normal high schoolers with secrets that they're hiding from everyone. Libby, famed for being the overweight teen who was air lifted from her home, and Jack, a young man who hides his disability through jokes and superficial relationships. The novel is told with a healthy mix of the past and present, but I found myself wanting more of the "past" chapters to help give the reader some more background into the characters' inner workings. Overall, the pacing was great - I was able to fly through this novel in just about two days and the ending was fulfilling. I was a bit worried that the story was spiraling out of control, but it all wrapped up nicely, and it was open enough to imagine a future of possibilities for our characters. Characters: Libby was a joy to read about. After a year of being homeschooled and being humiliated by the media with running stories about her weight, she is determined to make the most of returning to school and won't let anyone tear her down. I loved her spirit and reading about her coping skills. She felt real and got stronger and stronger as the story continued. Jack's family was also my favorite. There was so much grey area with their relationships and Jack's behavior overall - plus Jack's brother, Dusty, was a riot. There were some big moments in both the characters' lives that weren't elaborated on. Very early on in the book, we learn that Jack's father beat cancer, but there doesn't seem to be any left over emotions for Jack to explore. Libby gained a lot of weight in response to her mom's passing, but there was no mention of her coping skills from that experience and the new family dynamic with her father. Worldbuilding: Amos, Indiana is as exciting as you'd expect it to be. Niven did a great job giving it its' small-town feel, I actually could believe that this was a city in Indiana (I just googled it, it's not). Moreover, there is representation everywhere. Representation in race, mental health, and religion make this a realistic book about real people - not stereotypes. 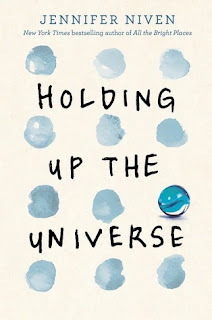 Short N Sweet: Holding Up the Universe is a feel-good novel that could have included more backstory. Nonetheless, it's a good read.